Blues advance into the second round, following a great performance. 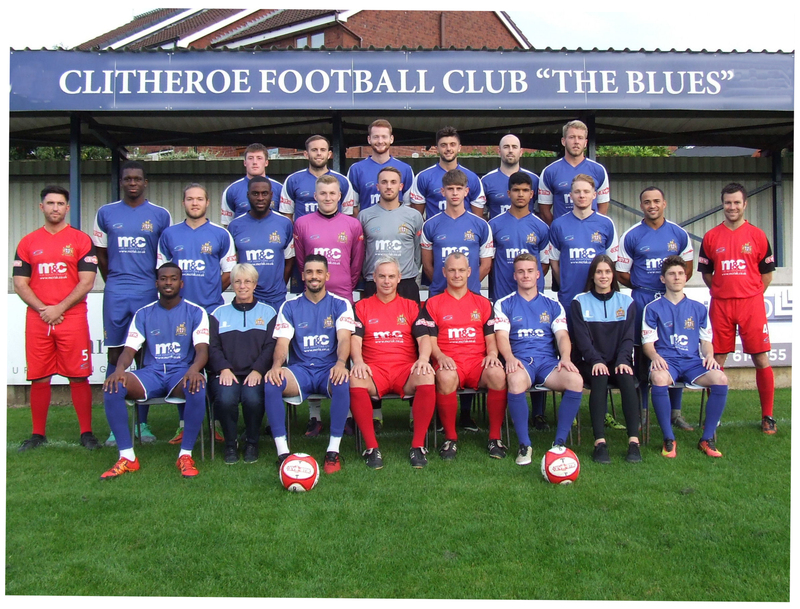 Following a disappointing run of home games, all of which have seen the Blues end on the losing side, Lee Ashforth would have been delighted to finally stop the rot, after beating Atherton Laburnum Rovers, to progress into the second round of the Lancashire FA Challenge Trophy. Both sides came into the game looking to take this competition seriously, especially with Clitheroe having missed out on securing their second ever title, following a narrow 3-2 defeat against Chorley in the 2018 Final. With the away side kicking off, it only took a matter of seconds before ‘The Laburnums’ conceded, after some dodgy play resulted in Clitheroe going ahead. A ball forward saw Laburnum’s goalkeeper, Anthony Hoodless try to clear the ball from around 25-yards out. Some good closing down by Jonah Gosling forced Hoodless to try and go long, but his clearance deflected off the forward and looped freakishly, into the back of the net as the Blues took the early 1-0 lead. On the 11th minute, Rovers nearly found themselves level, had it not been for the quick reactions of Blues goalkeeper, Cameron Terry. The away side’s good build-up resulted in Nathan Randall crossing into Henoc Mukend. Despite Mukendi – who is Rovers’ top goalscorer this season - connecting with the cross, Terry was there to deny the forward, his fifth goal of the season. Nine minutes after Mukendi’s miss, Clitheroe could have doubled their lead, had James Sloane kept his composure. The number 9, got on the end of Harry Cannon-Noren’s through ball, before rounding Hoodless and firing his shot over the bar, despite the gaping goal. On the 35th minute, Clitheroe crashed a header off the bar. Cannon-Noren’s corner was met by Josh Snowden whose powerful nod towards goal beat Hoodless in goal but didn’t have enough dip to sneak in under the crossbar. After a couple of missed attempts by Clitheroe, referee Richard Holmes called an end to the first-half. The second-half began with Clitheroe making one alteration to their side, as Jacob Gregory was brought on for the second period, to replace Ben Matthews, who had a solid first-half. Despite only being on the pitch for what was literally seconds, Gregory had the ball in the back of the net from Clitheroe’s kick-off, after he combined well with Gosling. Unfortunately for the substitute, his well-placed finish was ruled out due to offside. The 53rd minute saw the away side have their first attempt of the half, as Mukendi failed to hit the target from a header. Daniel Ashburner’s cross fell onto the forward’s head, whose connection saw the go behind for a goal-kick. A minute after Mukendi’s miss, Jacob Gregory, who was showing his quality, had his head in his hands, after embarrassingly missing an open goal. Cannon-Noren’s low cross took Hoodless out of the game, with Gregory only needing to tap the ball home to double his side’s lead. Somehow, he failed to connect with the ball, as it trickled past him. After a quiet period, the Blues made their second change of the game, as Antoine Recizac was brought on for James Sloane. Rovers reacted to that change minutes later, introducing Bradley Aspinall for Gary Burnett. With 15 minutes remaining, Recizac thought he had doubled Clitheroe’s lead, after his low effort found the back of the net. Much like Gregory’s disallowed goal, however, the winger saw his goal chalked off due to offside. Following the disallowed goal, Clitheroe made their final change which saw Macauley Harewood introduced for Cannon-Noren. Harewood’s impact was instant, as he set up fellow substitute, Jacob Gregory for his third attempt at goal. Gregory’s effort was well saved on the line by Hoodless. The 81st minute saw Recizac have a shot saved, before Rovers’ Nathan Randall and Matthew Marsh were also denied. With the game nearing completion, there was enough time for the Blues to grab two goals in quick succession to end the game at 3-0. Recizac grabbed Clitheroe’s second after Jacob Gregory’s lay-off allowed the winger to curl a shot into the bottom right-hand corner. The third goal to round off a good night, came courtesy of Jonah Gosling, who tapped home Jacob Gregory’s second assist of the half, to put the Blues into the next round. The Blues’ next game sees them make the 2-hour trip down to face struggling Chasetown FC in the league, on the 29th September, with kick-off scheduled for 3pm.